While watching the local news recently, I heard a heart warming story. A school student body was raising money by selling candy grams for Valentine's Day. A sucker was attached to a Valentine's card and delivered to the chosen student by paying a mere fifty cents. A young student asked his mother permission to buy all 750 students a candy gram. This entailed him emptying his piggy bank entirely. The young man, who has autism, wanted every student in the school to know they were included and had a friend. 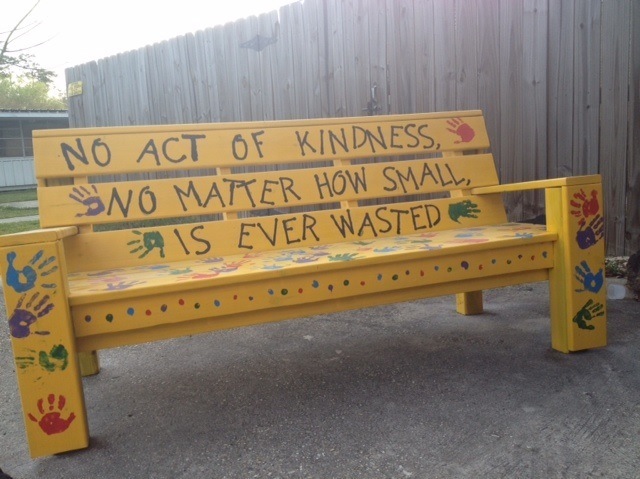 The money was being raised to purchase "Buddy Benches". 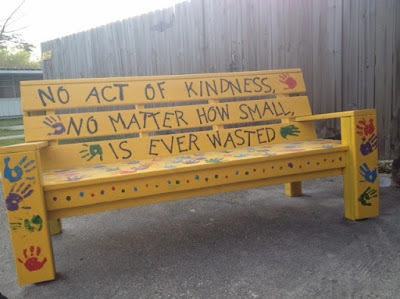 This beautiful concept entails a student who is feeling left out or lonely sitting on the Buddy Bench to signify they would like someone to come and talk to them. Perhaps I should put a "Buddy Bench" in front of my house or designate my swing the "Buddy Swing". There are times I yearn for conversation and no one is around to share. It has been extremely difficult here in Fort Worth to find those buddies to fill that void of silence. I find myself striking up a conversation with perfect strangers in the grocery store, at the gas station, and even walking the dog. I am hungry for interaction. While it was easier in Ruston with a lifetime of friends--there were still times of intense loneliness. I could talk to Hero, but his conversational skills are slim to none. It would be nice to have someone to trade the tales of the day, call with my latest bumble, speak of deep thoughts of God, and perhaps even talk about the crazy weather. God gave us a voice for a purpose--to communicate--and being single can lead to Communication Deprivation. Today's high tech world has further isolated us all. How many times have you been in a public place and seen everyone with their nose stuck in front of some screen. I am guilty at times also. Once I look around and see everyone staring at the little screen, I begin to feel inadequate and out of touch for not sharing in the world of social media. This is truly a SAD state of affairs! While visiting my friends in Ruston or my recent visit with friends in Raleigh, the time is not spent seeking constant entertainment, but instead in old fashioned conversation. Listening and speaking-contributing and gleaming-giving and taking in a lively conversation. It has been my experience one never feels alone when engaged in conversation. "I trust there is more. There is always more." And remember, God is often found in the silence. Oh Lulu ... if only I could live a bit nearer you then you can talk too me till the cows come home. I'll be listening ... promise. But you're too far away for me to sit on your Buddy Bench. Of course ... there's always e-mails if you wish to communicate something off-line from these Blogs ... or the phone. I'm feeling for you my friend, and praying too. You know Victor, perhaps God has a face to face chat planned for us and I could meet the wife and mother in law- you never know! Really would love to hear their side of the story-😊 In the meantime I will store your kind offer away in my heart and perhaps call upon it one day. I love the Buddy Bench. Emails and Chat/Skype are just not the same, right? My husband made that comment as the time is getting closer for me to move an hour from home for school. Believe it or not, I am the quiet one, hubby and son will talk your ear off if you let them. I can't seem to cross the Skype line- not always comfortable chatting in my day to day dress or lack thereof😳 I know you realize those last couple of years will fly by! And my door is always open, My Friend!